Information from clinical trials in children with MS is furthering understanding and improving treatment options for this rare presentation. Multiple sclerosis (MS) most commonly presents in adulthood; however, in 3% to 5% of patients with MS, the first clinical attack occurs prior to age 18 years.1 The first demyelinating attack in childhood is termed an acquired demyelinating syndrome (ADS), which may be a monophasic illness or a first attack of a relapsing demyelinating disorder, such as MS. The proportion of children with ADS who have MS ranges from 15% to 45%.2 Pediatric-onset MS (POMS) follows a relapsing-remitting course at onset, with fewer than 2% of pediatric patients presenting with a primary progressive form of MS.1,3 More frequent relapses in early disease stages compared with adults is characteristic of POMS.4 Children tend to have more complete recovery after attacks, and disability accumulation is slower compared with adult-onset MS. Secondary progressive disability usually does not occur until approximately 20 years after onset.1,3 Treatment is largely based on data obtained from clinical trials in adult patients; however, there are 2 recent randomized clinical trials performed in children that provide high-quality efficacy and safety data. In this review, we discuss the clinical features, neuroimaging, disease course, and available treatments for children with MS. Although children with POMS have better physical disability outcomes compared with adults, significant cognitive impairment and fatigue are prominent features of POMS. In a study of 63 patients with POMS, approximately 31% fulfilled criteria for cognitive impairment and 73% reported fatigue.13 Another study of 68 patients with demyelinating disease found those with POMS were less likely to participate in vigorous (P = .009) or moderate (P = .048) physical activity than either patients with monophasic demyelination or healthy controls subjects.6 Further research is required to better identify the factors that limit engagement of those with POMS in vigorous activity. 3. Cortical lesions can be used to fulfill MRI criteria for DIS. In addition to conventional imaging designed to detect T2 bright and T1 hypointense lesions, quantitative analyses as well as other MR sequences provide insight into nonlesional pathology. Diffusion tensor imaging (DTI) has shown nonlesional widespread tissue disruption early in the disease course of POMS and even in monophasic demyelination; however, children appear to be less affected by these findings suggesting resilience in the maturing brain.17 These findings from DTI indicate that early demyelination that is not detected on conventional MRI might contribute to long-term outcomes and disease progression. The natural history of POMS, with high relapse rates and higher volume of brain lesions early in the disease, supports a role for prompt initiation of effective disease-modifying therapy. Guidance for treatment of POMS has largely been derived from clinical trials in adult patients, small case series, international consensus guidelines, and retrospective studies in children. Recent and ongoing clinical trials in the pediatric population are beginning to provide more rigorous efficacy and safety data. For chronic disease management, traditional first-line therapies have included interferon β and glatiramer acetate. Both demonstrated a 29% to 34% reduction in ARR and decrease in new MRI lesion development in adult patients.19,20 Although there have been no treatment trials of interferon β in children, safety and tolerability have been demonstrated and published in retrospective reviews.18,21 In a study of 65 patients with POMS, the mean ARR decreased during treatment with either interferon β-1a (from 2.4 to 0.4) or glatiramer acetate (from 2.8 to 0.25).22 The limitations of retrospective data to inform on efficacy, however, must be considered. A recent randomized, double-blind, placebo controlled 2-year trial compared oral fingolimod with weekly intramuscular interferon β-1a.23 Fingolimod was associated with a lower rate of relapse and less lesion accumulation on MRI, leading to approval by the Food and Drug Administration (FDA) and regulatory agencies in other countries for use of fingolimod to treat children with MS who are over age 10 years. For patients weighing less than 40 kg, a dose of 0.25 mg daily is used; the standard adult dose of 0.5 mg daily is used for those weighing more than 40 kg. Currently active clinical trials are evaluating efficacy and safety of dimethyl fumarate,24 teriflunomide, and alemtuzumab for POMS (Table). Another monoclonal antibody directed against CD20, ocrelizumab, has shown efficacy in treatment of adults29 with relapsing-remitting MS in 2 large clinical trials. Studies are being planned to investigate this medication for treatment of POMS. In children, MS has a relapsing-remitting course with frequent relapses early in the disease but with minimal disability accrual. Cognitive impairment and continued cognitive decline, however, are of major concern and have the potential to negatively impact long-term quality of life. Effective therapy reduces relapse rates, brain lesions, and brain atrophy. The long-term benefit of early therapy remains to be seen, and close monitoring for potential therapy-mediated morbidities is necessary. Because POMS is a rare disease, it is imperative for continued recruitment of patients with POMS into research studies and clinical trials on a multinational level to better understand the implications and management of POMS. Finally, given the chronic nature of this disease, emphasis on smooth transition of care from pediatric MS providers to adult MS providers is needed to ensure excellent continuity of care. 1. Renoux C, Vukusic S, Confavreux C. The natural history of multiple sclerosis with childhood onset. Clin Neurol Neurosurg. 2008;110(9):897-904. 2. Brenton JN, Banwell BL. Therapeutic approach to the management of pediatric demyelinating disease: multiple sclerosis and acute disseminated encephalomyelitis. Neurotherapeutics. 2016;13(1)84-95. 3. Waldman A, Ness J, Pohl D, et al. 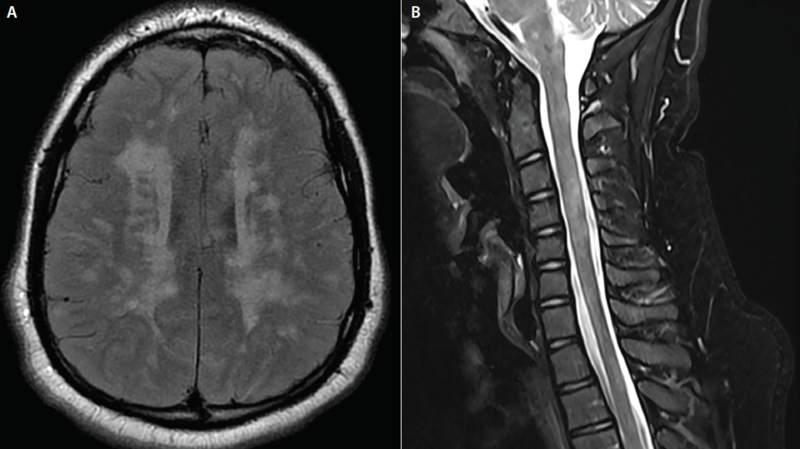 Pediatric multiple sclerosis: clinical features and outcome. Neurology. 2016;87(9):S74-S81. 4. Koch-Henriksen N, Sorenson PS. The changing demographic pattern of multiple sclerosis epidemiology. Lancet, 2010;9:520-532. 5. Benson LA, Healy BC, Gorman MP, et al. Elevated relapse rates in pediatric compared to adult MS persist for at least 6 years. Mult Scler Relat Disord. 2014;3(2):186-193. 6. Otallah S, Banwell B. Pediatric Multiple Sclerosis: an update. Curr Neurol Neurosci Rep. 2018;18(11):76. 7. Vargas-Lowy D, Kivisäkk P, Gandhi R, et al. Increased Th17 response to myelin peptides in pediatric MS. Clin Immunol. 2013;146(3):176-184. 8. Disanto G, Magalhaes S, Handel AE, et al. HLA-DRB1 confers increased risk of pediatric-onset MS in children with acquired demyelination. Neurology. 2011; 76(9)781-786. 9. Banwell B, Krupp L, Kennedy J, et al. Clinical features and viral serologies in children with multiple sclerosis: multinational observational study. Lancet Neurol. 2007;6(9):773-781. 10. Gianfrancesco MA, Stridh P, Rhead B, et al. Evidence for a causal relationship between low Vitamin D, high BMI, and pediatric-onset MS. Neurology. 2017;88(17):1623-1629. 11. Mowry EM, Krupp LB, Milazzo M, et al. Vitamin D status is associated with relapse rate in pediatric-onset multiple sclerosis. Ann Neurol. 2010;67:618-624. 12. Lavery AM, Collins BN, Waldman AT, et al. The contribution of secondhand tobacco smoke exposure to pediatric multiple sclerosis risk. Multiple Sclerosis Journal. 2018. 13. Amato MP, Goretti B, Ghezzi A, et al. Cognitive and psychosocial features in childhood and juvenile MS: two-year follow-up. Neurology. 2010; 75(13)1134-1140. 14. Thompson AJ, Banwell BL, Barkhof F, et al. Diagnosis of multiple sclerosis: 2017 revisions of the McDonald criteria. Lancet Neurol. 2018; 17:162-173. 15. Fadda G, Brown RA, Longoni G, et al. MRI and laboratory features and the performance of international criteria in the diagnosis of multiple sclerosis in children and adolescents: a prospective cohort study. Lancet Child Adolesc Health. 2018; 2(3):191-204. 16. Banwell B, Arnold DL, Tilema J-M, et al. MRI in the evaluation of pediatric multiple sclerosis. Neurology. 2016;87 (9):S88-S96. 17. Vishwas MS, Healy BC, Pienaar R, Gorman MP, Grant PE, Chitnis T. Diffusion tensor analysis of pediatric multiple sclerosis and clinically isolated syndromes. AJNR Am J Neuroradiol. 2013;34(2)417-423. 18. Banwell B. Treatment of children and adolescents with multiple sclerosis. Expert Rev Neurother. 2005;11(4)505-520. 19. The IFNB Multiple Sclerosis Study Group. Interferon beta-1b is effective in relapsing-remitting multiple sclerosis. I. Clinical results of a multicenter, randomized, double-blind, placebo-controlled trial. Neurology. 1993;43(4)655. 20. Johnson KP, Brooks BR, Cohen J a, et al. Copolymer 1 reduces relapse rate and improves disability in relapsing-remitting multiple sclerosis: results of a phase III multicenter, double-blind placebo-controlled trial. The Copolymer 1 Multiple Sclerosis Study Group. Neurology. 1995;45(7)1268-1276. 21. Banwell B, Reder AT, Krupp L, et al. Safety and tolerability of interferon beta-1b in pediatric multiple sclerosis. Neurology. 2006;66(4)472-476. 22. Ghezzi A, Amato MP, Capobianco M, et al. Disease-modifying drugs in childhood-juvenile multiple sclerosis: results of an Italian co-operative study. Mult Scler. 2005;11(4)420-424. 23. Chitnis T, Arnold DL, Banwell B, et al. Trial of fingolimod versus interferon beta-1a in pediatric multiple sclerosis. N Engl J Med. 2018; 379:1017-1027. 24. Alroughani R, Das R, Penner N, Pultz J, Taylor C, Eraly S. Safety and efficacy of delayed-release dimethyl fumarate in pediatric patients with relapsing multiple sclerosis (FOCUS). Pediatr Neurol. 2018;83:19-24. 25. Polman CH, O’Connor PW, Havrdova E, et al. 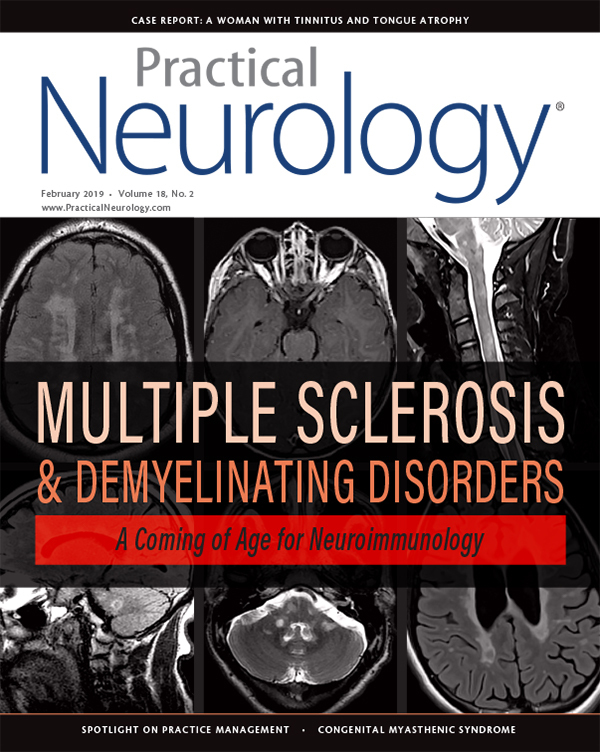 A randomized, placebo-controlled trial of natalizumab for relapsing multiple sclerosis. N Engl J Med. 2006;354:899-910. 26. Ghezzi A, Pozzilli C, Grimaldi L, et al. Natalizumab in pediatric multiple sclerosis: results of a cohort of 55 cases. Multiple Sclerosis Journal. 2013;19(8):1106-1112. 27. Krysko KM, Graves J, Rensel M, et al. 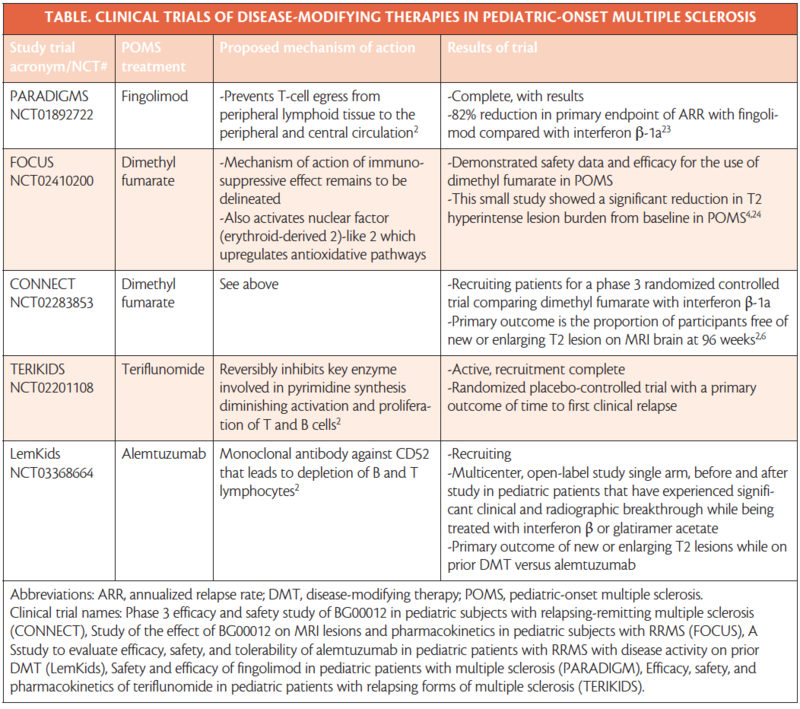 Use of newer disease-modifying therapies in pediatric multiple sclerosis in the US Neurology 2018;91(19):e1778-e1787. 28. Dale RC, Brilot F, Duffy LV, et al. Utility and safety of rituximab in pediatric autoimmune and inflammatory CNS disease. Neurology. 2014;83:142-150.